Azkoyen is a multinational group whose main lines of work focus on the vending machine, means of payment and catering sectors. Our products are distributed in more than 50 countries on five continents. The Azkoyen Palma vending machine has a number of user friendly features. The electronics and product options are easy to configure, and it is simple to change the product and price decals. 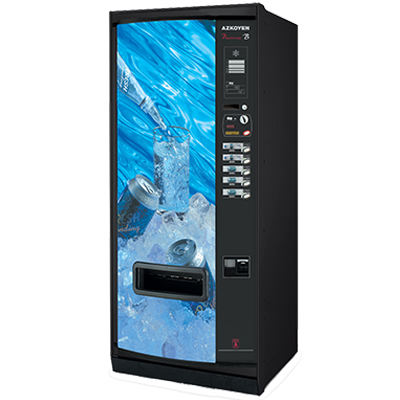 The Azkoyen Palma B5 has an innovative and flexible vending operation; a universal extraction system which is ideal for dispensing glass, cans and PET bottles. Security need not be a worry as your interests will be protected by: a galvanised steel body, a three-point door anchorage (with high security lock), plus an anti-pry door surround and steel selection buttons.